Be'eri Printers is Israel's leading supplier of advanced mailing and printing services, security printing, ID cards and credit cards. 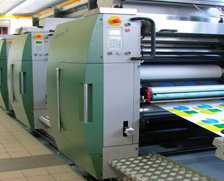 Be'eri Printers has six decades of proven experience and pioneering work in digital printing, developing innovative enveloping processes, and providing comprehensive services - from product design to mailing and forwarding, while offering an unmatched range of solutions. computerized magnetic checkbooks (1979), a patented data self-mailer (the Ma'atafit in 1984), and co-developing (with Scitex Digital Printing) the world's first and fastest full process digital color system – the VariColor. Be'eri Printers, wholly owned by Kibbutz Be'eri, was established in 1950. Thanks to its creative technologies, daring yet sound business initiatives and innovative work methods, Be'eri Printers has been setting standards for the printing industry in Israel and overseas.